Ok I get how to disable Image Capture from opening for a specific device, but I'm an iOS developer and I work with a lot of devices. Is there a way to stop this ruddy app from launching the first time I connect any new device? It's a serious invasion of privacy when I connect someone's phone and immediately see their photos plastered on my screen for the world to see! One solution might be to use Cameras from Flexibits. Install this preference pane and set "When you connect new cameras:" to "Do nothing" and it should stop your Mac from automatically opening Image Capture when you connect a new device. Note that Flexibits don't update it anymore, and don't even offer it on their website but in the limited testing I was able to do it does still seem to work. Also since it isn't updated any longer it's a 32-bit preference pane so you'll get that "To use ... preference pane, System Preferences must quite and reopen." when you open it. However you only need to open it once to set the "When you connect new cameras:" option. Once Image Capture is open, click the device in the list, then: Bottom left corner of the application, small triangle. There: switch it to "no application". 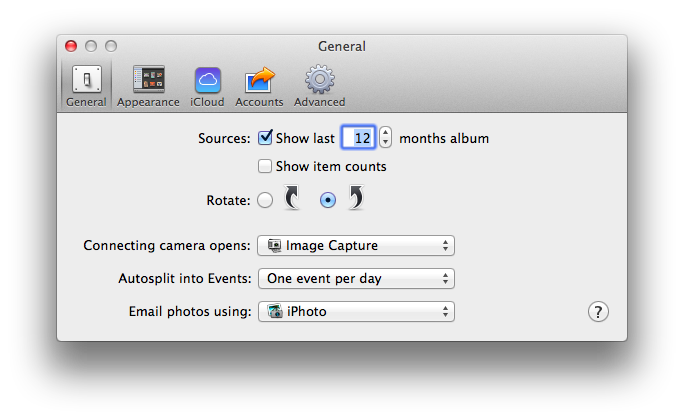 You have to open iPhoto, go into iPhoto Preferences and next to Connecting camera opens: select No Application. You can also change the permission and remove any access rights on the application package/folder. I used this on iTunes as well to prevent it from starting when pressing play and not having Spotify open. or rightclicking the app, opening the info window, scrolling to the bottom of the view and changing them there. Not sure if -currentHost is really needed, or if it would also work without it. Maybe it depends on the OS version. Yes, deleting the app indeed does work. So it's got that going for it which is nice. 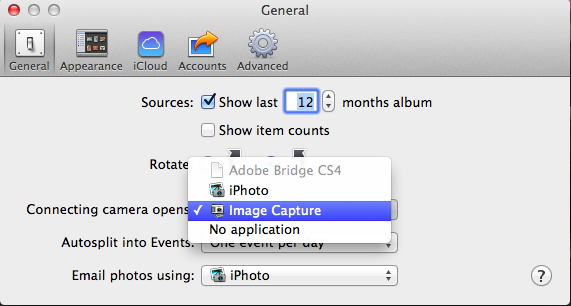 However, I renamed the offending application to "Image Capture.disabled" to fix the problem. Not the answer you're looking for? Browse other questions tagged macos ios image-capture . How to stop syncing apps with iTunes without wiping them from my iPhone? How do I import only new photos with Image Capture. Image capture “import error (-50)” images import fine, but won't delete from phone? How Do I Import Burst Photos That Aren't Being Recognized By My iMac? How can I erase all photos on my iOS 11 device that can't be removed with Image Capture trick? Why does Image Capture import fewer pictures than it counted?